In our last house we had a half bathroom downstairs. It wasn't very big, but we chose to have fun with it and painted one wall in a bright blue. We kept the accents neutral with black and white. We wanted to do something similar in our new half bath because we really liked the black and white pieces that we had. So instead of changing the accent colors we decided to go with a whole new wall color. Our half bath in this house is very long and narrow, with the toilet facing the sink. Which gives us one very long wall. This is the wall that we will paint. Pretty much the day after we got here we bought paint samples. 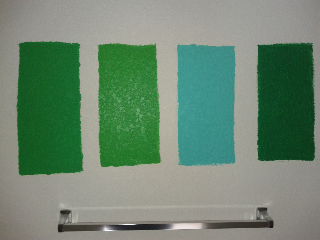 I was really leaning towards a bright kelly green, though one aqua blue did make it into the mix. 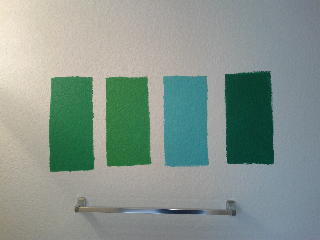 Funny enough when I posted a photo with the paint swatches on my FB wall everyone went straight for the aqua. Out of the four colors we decided to go with the green on the far left. It is the perfect brightness and doesn't have as much yellow in it as the one next to it. In fact for all of the paint swatches we have around the house, this was the first color to be chosen for a room (then we decided on navy for the guest bedroom). The green is Behr's "Formal Garden", it's bright, fresh and exactly what we wanted. The bath rug is a carry over from our last bathroom and is from Target. We also want to update the faucet for the sink, which is actually a nice pedestal sink. And we want to get rid of those awful, cheap looking "Hollywood" dressing room lights. We're still not sure what kind of lighting we'll go with, but a little crystal bling never hurt anyone! Something else that we may end up doing is moving the towel bar (seen in swatch photos). It sits pretty much in the middle of the wall and it's unattractive. If anything we'll get a towel ring and move it closer to the sink. Plus it will free up the wall for art...which I'm thinking I'll keep black and while. This is probably one of the easiest rooms for us to work on, but I think the paint and new fixtures will make for a fresh new look. Which is great because it will be one of the rooms that anyone coming over will see/use.